By boosting the power of a patient’s immune cells, researchers from the City of Hope Beckman Research Institute have demonstrated the potential for a revolutionary new therapy to treat a particularly aggressive form of brain cancer. But given the limited results, many questions remain. Things were starting to look bleak for a 50-year-old patient being treated for a deadly form of brain cancer known as recurrent multifocal glioblastoma, an often fatal condition in which cancer spreads to multiple parts of the brain and spinal column. The patient was not responding to the usual battery of treatments, including radiation, surgery, and anti-tumor medications, so the doctors decided to enroll him a clinical trial designed to test the safety of a new cancer treatment called CAR-T cell therapy. Seven-and-a-half months later, the patient’s tumor had shrunk to virtually nothing, and he went into remission. Had the patient not received the experimental treatment, his doctors say he would have likely died by now. The tumors have since returned, but importantly, not in the areas of the brain that were treated. It’s a limited result, but an important precedent for an immunotherapy that had previously only been shown to work with blood cancers. These results, now published in the New England Journal of Medicine, couldn’t have come at a better time. CAR-T immunotherapy, in which white blood cells are reprogrammed to attack cancer cells—took a hit recently following the deaths of four cancer patients enrolled in a Juno Therapeutics Phase II clinical trial. It’s not clear if the deaths were due to a reaction between a chemotherapy drug and CAR-T, or if they were caused by CAR-T alone. It’s simply too early to know, leading to criticisms that the experimental therapy is being overhyped and oversold. These concerns notwithstanding, the early enthusiasm is understandable. In a study conducted earlier this year, 94 percent of terminally ill patients who were treated with CAR-T went into remission. This immunotherapy has shown promise in treating blood cancers like lymphomas and leukemias, and it’s become an indelible part of President Obama’s ambitious “Moonshot” to accelerate cancer research. And now, as the first results from an application of CAR-T directly to a cancer site show, this therapy may be used to combat solid tumors as well. The glioblastoma therapy is currently being developed by NYC-based Fortress Biotech (FBIO) subsidiary Mustang Bio, and is being tested by researchers from the City of Hope Beckman Research Institute. To get things started, a research team led by Benham Badie extracted immune cells, specifically T cells, from the patient, and then added a receptor that helps the cells target specific tumors. 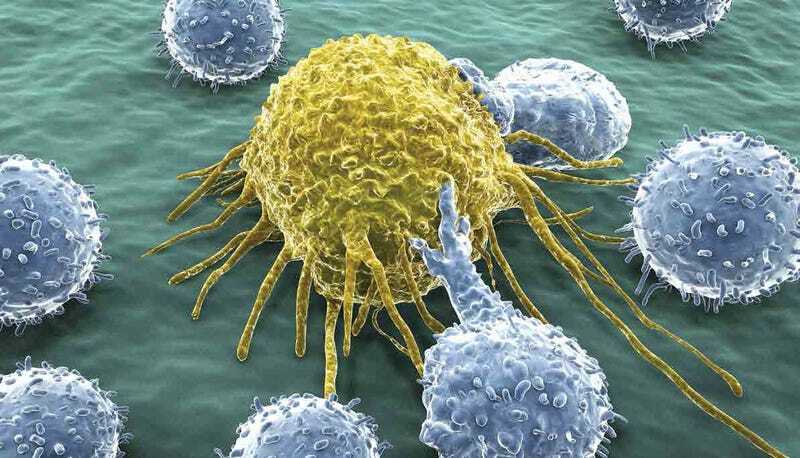 Unlike unmodified T cells, which attack and then die, these jacked cells stick around in a patient’s immune system for a long period of time (possibly a decade or more, the researchers say), and grow a new batch of cancer-killing cells that can attack and destroy future tumor cells. Following surgery to remove most of the patient’s brain tumor, surgeons injected the site with the CAR-T cells. This was repeated five more times, and after four months, the tumor stopped growing. Ten more doses of the modified immune cells were added to stop a number of other smaller growths in the patient’s brain. Importantly, the low dosages of CAR-T cells did not cause any serious complications or damage the patient’s brain any further. After 7.5 months, almost all tumors had disappeared. “I believe these recent results show we have a potential breakthrough treatment that may have a remarkable impact on patients with malignant brain tumors,” noted Badie in a release. Encouragingly, there are nine other patients enrolled in this study, and they’re all responding similarly. And because the modified cells were injected directly to the tumor site, and not intravenously as has been done in other CAR-T treatments, this technique could be used to target other solid tumor cancers, such as pediatric brain cancers and even breast and prostate cancers. Here’s the bad news: tumors have re-emerged in the patient’s brain, though in areas not treated with the CAR-T cells. Badie says these tumors are comprised of receptor proteins that aren’t recognized by the modified immune cells, implying that future treatments will likely have to include an array of CAR-T cells, each designed to target a specific brand of tumor. That presents an immediate and obvious challenge to the researchers. Even though this was a provocative case, even in this one case the cancer has already returned. Will CAR-T work for other patients? Will it help most patients? Will it be better than alternatives? And will patients live longer or live better? We don’t know.